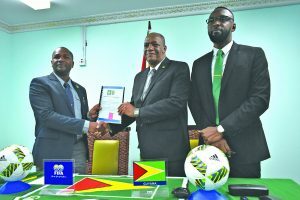 History was created on Friday when the Guyana Football Federation (GFF) signed a Memorandum of Understanding (MoU) with the Government of Guyana for the 30-year lease of 7.3 acres of land to construct a football facility at D’Urban Park, Georgetown. 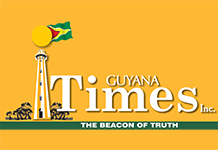 This facility, which will be known as the ‘GFF D’Urban Park Football Complex’ is expected to accommodate an international quality full-size pitch, two mini-pitches and a new headquarters for the Federation. President Wayne Forde, and Minister of State Joseph Harmon, on behalf of the Government of Guyana (GoG). This signing will pave the way for the commencement of construction, which is scheduled to be completed by 2021. 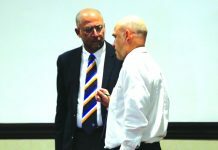 The mini pitches are expected to be available to the community on a 24-hour basis. 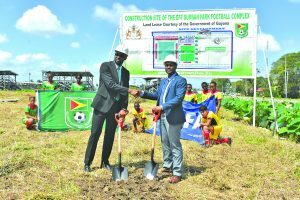 Following the signing, sod-turning was done at the proposed site at D’Urban Park by GFF President Forde and Director of Sport Christopher Jones against an unveiling of a billboard on the site, Forde also presented an official FIFA match ball to Minister Harmon.